Small tablet. Toshiba installs Nvidia's high-performance Tegra 3 platform in an awesomely compact case in the AT270. The AMOLED screen is only 7.7-inches but provides a high resolution. Will this work? 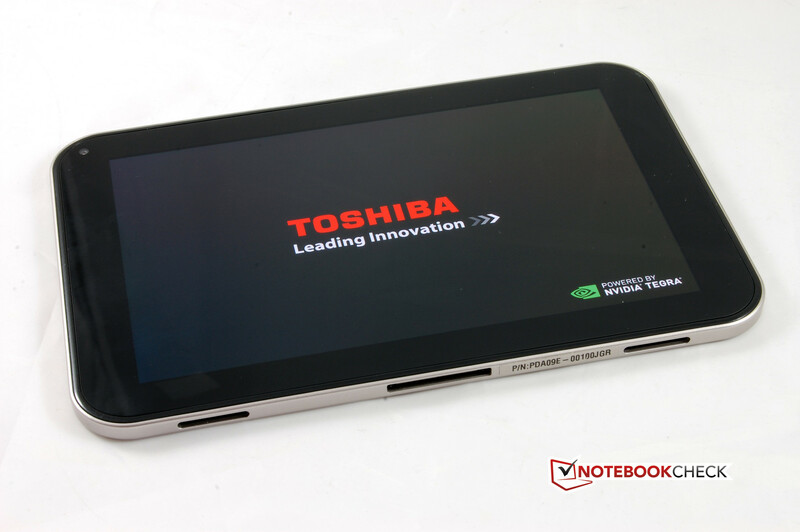 We last reviewed a tablet from Toshiba in March this year: the AT200 featured a 10.1-inch screen and a dual-core SoC from Texas Instruments. 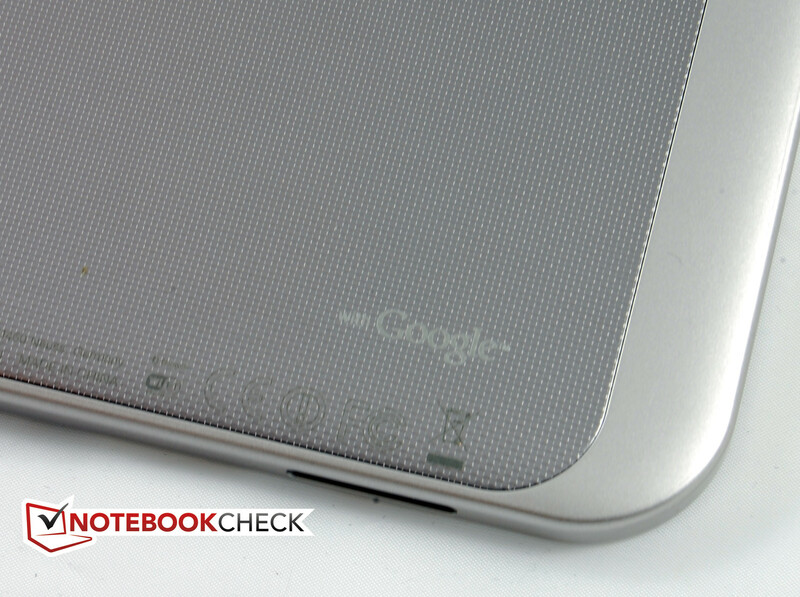 The mainstream tablet basically did a good job, but it was not cheap. You may be inclined to believe that the name AT270 indicates an updated and somewhat refreshed successor. But that is wrong - just looking at the screen alone and we can see a significant difference. The newest scion from Toshiba belongs to the comparatively rare species featuring a screen size of seven inches. To be precise, it is 7.7-inches. Toshiba's AT270 has to compete with the very low-priced Google Nexus 7 that currently occupies the 7th place of our Top 10 Tablets. With the AT270, Toshiba wants to position a very portable tablet that nevertheless does not make any compromises regarding performance, equipment and screen. Thus, it opted for Nvidia's Tegra 3 platform based on Android 4.0, a 32 GB internal memory and an AMOLED screen protected by Corning Gorilla Glass. Toshiba does not install a 3G module, which is incomprehensible in view of the compact size and the recommended price of 549 Euros (~$707). But now to the small tablet's test. Toshiba's AT270 feels just like a small slate in a positive sense. Its build of less than eight millimeters is very slim, does not feature any curves or coves on the casing and is very rigid. So, it is a stable little "Surf-board". However, it produces quiet creaking noises when we try to twist it. 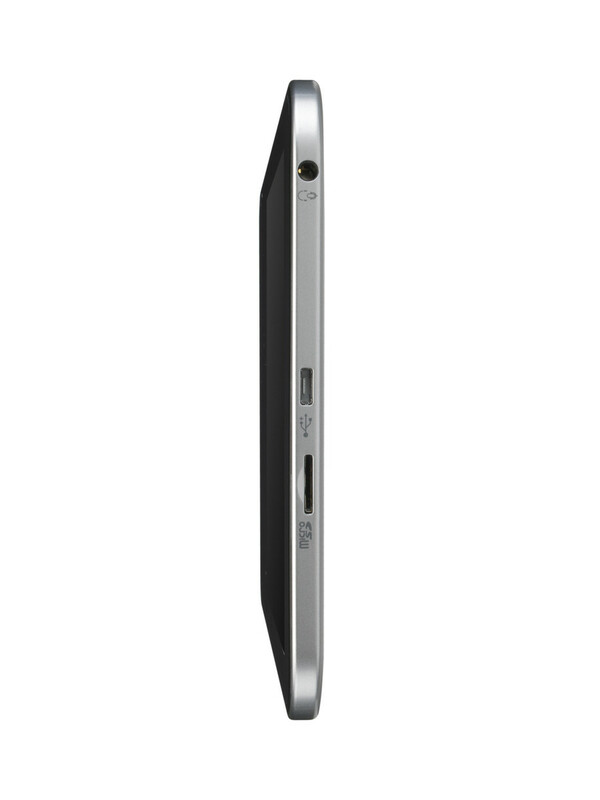 The casing is completely made of aluminum and makes a high-quality impression. Although the rough finish curbs the last ounce of elegance, it is comfortable to hold and mostly prevents fingerprints. 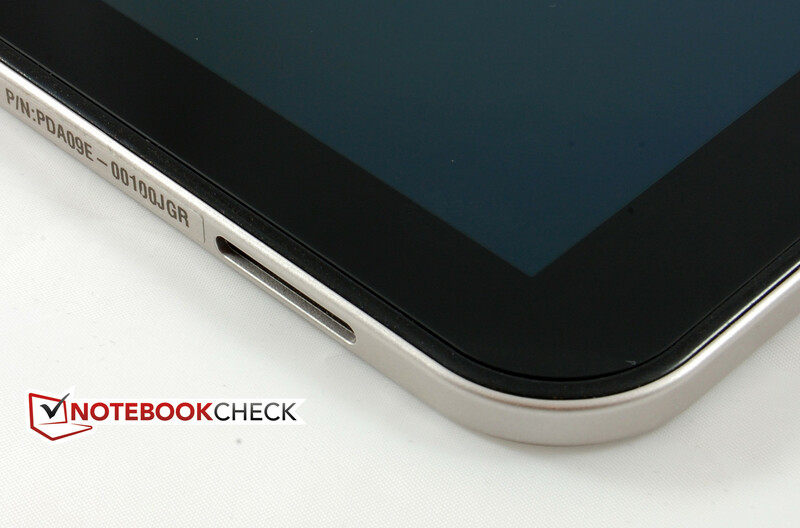 Only a narrow, high-polished bezel frames the tablet. The rear also exhibits a smooth strip of approx. 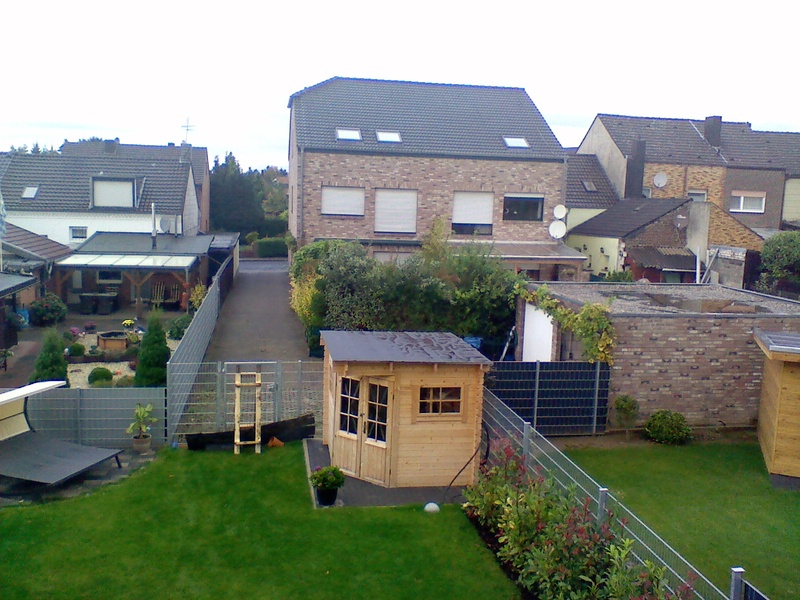 1.5 cm on the right where the camera is located. All interfaces and ports are open and not hidden behind dust protection flaps. The controls, including a small slider to lock the screen content, are placed conveniently at the devices upper edge. The multipurpose interface that is also used for recharging is at the lower edge. 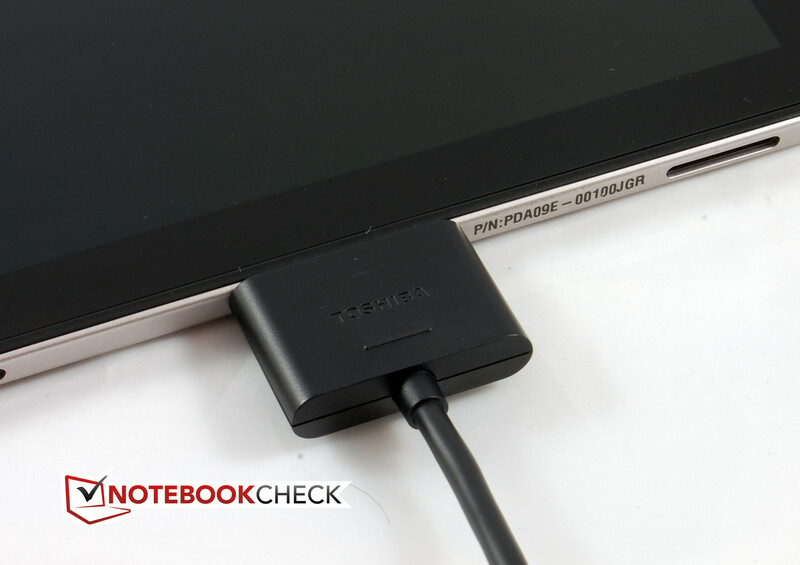 Unlike the tablet's design language, Toshiba uses a plug size that is not slim and compact. It measures a whole 3.9 x 3.5 centimeters and does not match to the AT270's delicate appearance at all. The tablet itself is only 7.8 x 204.5 x 135.2 millimeters and weighs 332 grams. Thus it is the perfect take-along device - at least in terms of size and weight. In contrast to the case, the equipment is not at all small but absolutely appropriate for a premium-range tablet. Nvidia's well-tried Tegra 3 quad-core SoC (system-on-a-chip) with a default clock of 1.3 GHz in multi-core operation creates the basis. When only one core is processing, the clock is increased to 1.4 GHz providing that the thermal conditions permit it. The Tegra 3 platform also sports an energy-savings core for basic tasks, such as idle mode, as well. Nvidia's GeForce ULP GPU for 3D computing power is also integrated on the chip. Toshiba relies on the category's standard working memory in form of a 1 GB LP-DDR2 SDRAM. 32GB of internal memory is available and can be expanded via a micro SD card. The corresponding reader is found on the case's right. 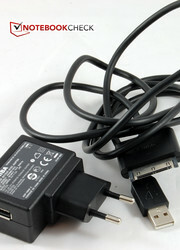 Two cameras, two stereo speakers and a combo jack for headphones and microphone also belong to the tablet's equipment. Mainstream also applies to the operating system. Android 4.0 aka Ice Cream Sandwich is not Google's newest operating system. However, this OS is certainly a well-tried and stable working version. The manufacturer has not yet released any information about a possible update to Android 4.1 Jelly Bean. Toshiba hardly modified the Android system. The user can only choose between the default keyboard and a Swype keyboard. The latter promises faster typing because the finger virtually glides over the keyboard and does not have to be lifted. It is ultimately a matter of taste which keyboard is preferred. The Wi-Fi module worked well. 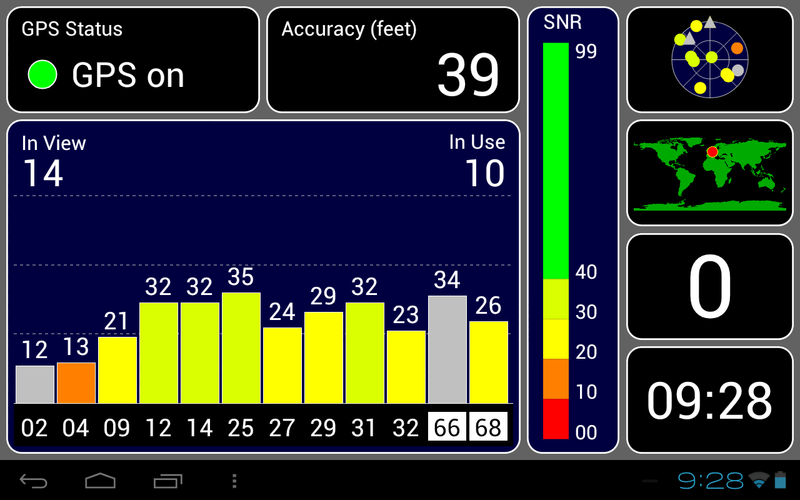 It excelled with a long range and its GPS sensor. The initial tracking was completed in less than 30 seconds. Reception was always stable outdoors. Although the Wi-Fi module supports 802.11 b/g/n and consequently high speeds, Toshiba's AT270 does not transmit on the wider 5 GHz band. The not quite up-to-date but still acceptable Bluetooth version 3.0 is also installed. 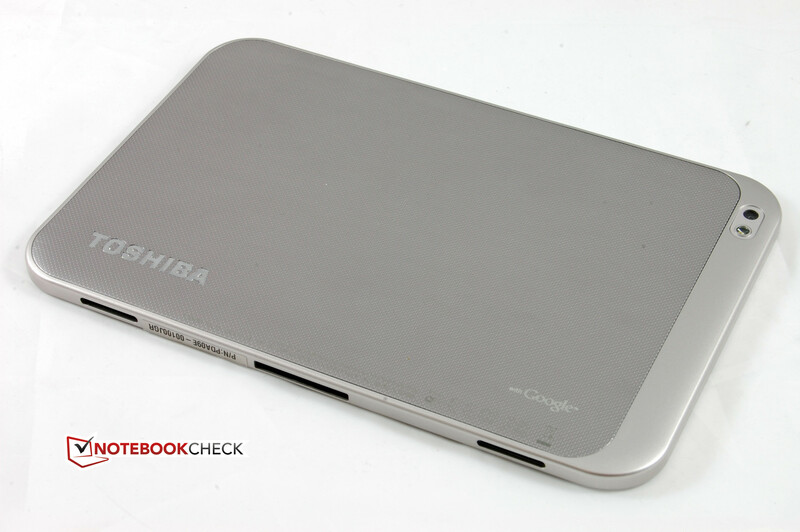 The two camera modules in Toshiba's AT270 are not centered on either side of the case like in most other tablets. Toshiba places the front-face camera in the upper left corner instead. 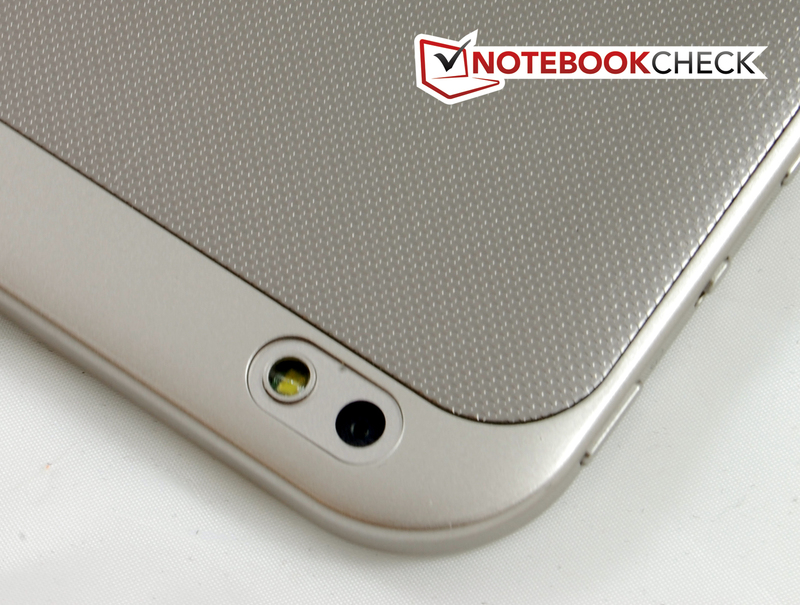 The rear-face camera is located a few centimeters lower on the opposite and is accompanied by an LED flash. The front-face model, mainly designed for video calls, has a resolution of two mega-pixels. It only makes videos in an outdated VGA format of 640x480 pixels. The picture quality of both pictures and videos is unusable. The colors are alright but they lack focus. Moreover, videos jerk when the camera is swayed. The rear-face camera features a 5 mega-pixel sensor that is absolutely sufficient for snapshots and smaller prints. Unfortunately, the pictures are overlaid with a kind of film and are much too pale on the whole. 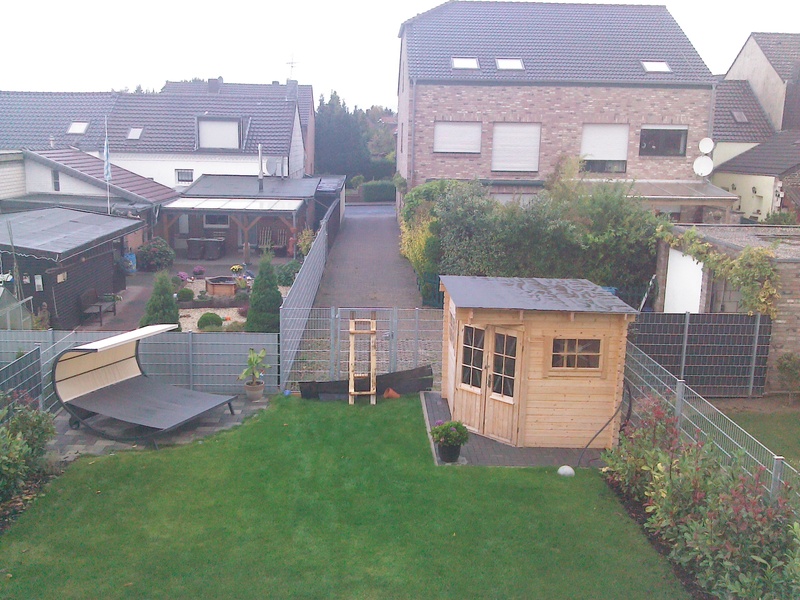 The camera does not convince in diffuse light because the pictures look very grainy. The LED flash does not improve that much either as it gives the pictures a very unnatural look. The rear-face camera shoots videos in 720p, which is also outdated in this price range. However, the clips are impressive especially since the sensor copes well with brightness changes. The AMOLED screen's excellent black value is noticed when playing videos. Particularly dark scenes benefit from it. Movie enjoyment is however marred by the weak speakers that not only lack dynamic and volume, but also sound tinny. Headphones should definitely be used for videos, music and games. Regrettably, headphones are not included. Another disappointment is that the YouTube app does not render 1080p videos very smoothly. Although they only stutter occasionally, sensitive users will find it annoying. Not many accessories are included. Besides the PSU with a rather inflexible cord, there are only a few paper documents in the box. However, Toshiba already has optional accessories in its range. 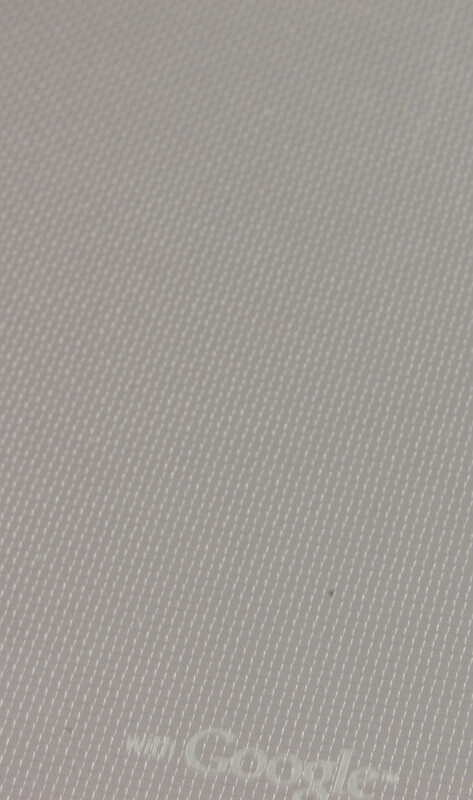 For example, there is a protective cover called SLIM SLEEVE and a screen protector with the same name. Prices were not set at the time of this review. Toshiba's AT270 includes a 24 month standard warranty. 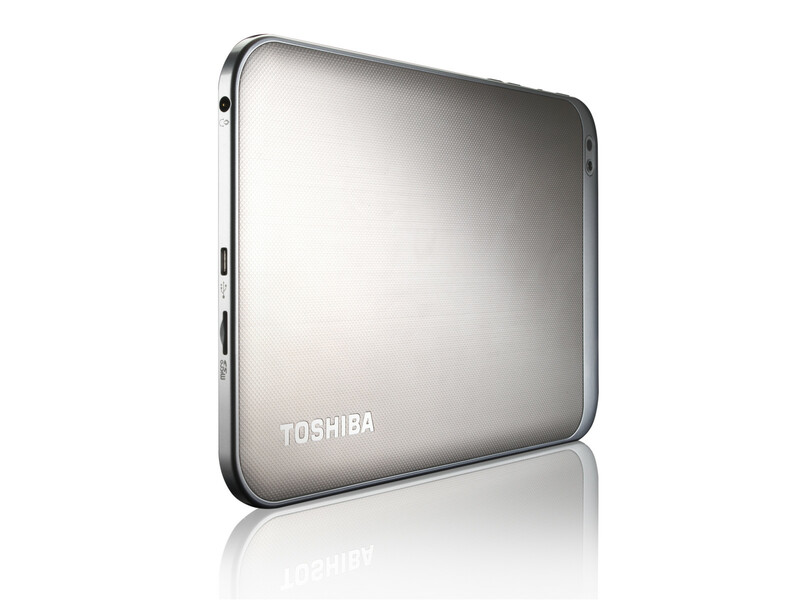 Toshiba offers a free on-site pick-up service when the user registers the service case via Toshiba's notebook hotline. Otherwise, the device has to be sent in. There are also warranty upgrade options. The one year "no-matter-what-happens" warranty costs a reasonable 59 Euros (~$76). An upgrade to a total of four years for 109 Euros (~$140) is also affordable and has worldwide validity. The warranty services can only be called exemplary. We noticed the odd stutter while playing FullHD videos. This is not true for sophisticated 3D games. They run flawlessly. But we did not expect anything else from Nvidia's GeForce ULP. We currently use the race simulations Raging Thunder 2 and Need for Speed: Hot Pursuit as well as the third-person shooter ShadowGun for the gaming tests. The controls are just as important for gaming fun. The screen's rather smooth surface is impressive, although we would have appreciated a somewhat better gliding characteristic. The gyroscope proved to be very sensitive and needs a certain familiarization at first, particularly because moving the small case leads to stronger maneuvers than known from bigger tablets. Games are really fun when you have gotten used to it though. 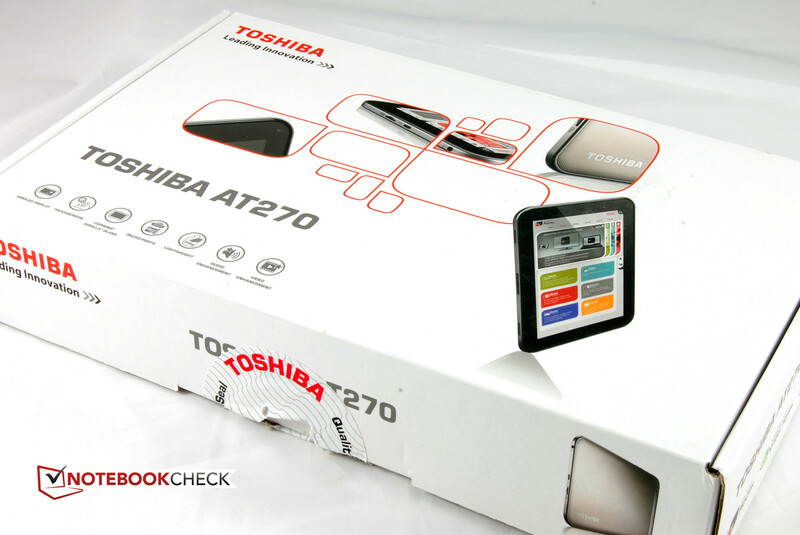 One thing first: It is possible to work smoothly on Toshiba's AT270 without restrictions. Nvidia's high-performance Tegra 3 chip and Google's fully-developed Android 4.0 ICS OS simply create a very good basis for this. Moreover, the touchscreen works perfectly. It detects touches reliably and implements these without delay. 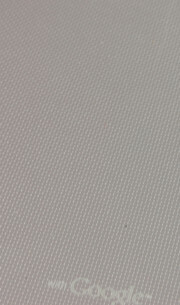 The scratch-resistant Corning Gorilla glass surface's gliding characteristic is acceptable but could be a bit better. Rotating content takes a second but it works in all directions. Automatic rotation can be disabled via a slider on the device's upper edge. The keys on the virtual keyboard are quite small due to the fairly small 7.7 inch screen,. However, we did not have problems hitting the keys reliably in landscape mode, which is likely the most frequently used mode. We favored Android's default keyboard over the Swype version in the test. The latter is a bit too overloaded for our taste. The first thing noticed about the screen in Toshiba's AT270 is its small size. 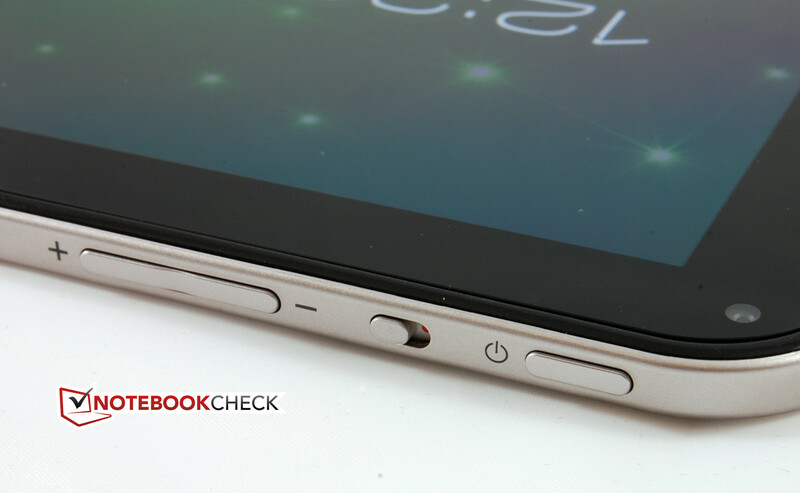 The screen's diagonal is 7.7 inches and makes the tablet to an extremely compact device. Nevertheless, the user does not have to accept losses in resolution. Although the AT270 cannot serve with FullHD, the common 1280x800 pixels found in 10-inch devices is also available here. Toshiba uses an AMOLED screen for the first time in one of its tablets. 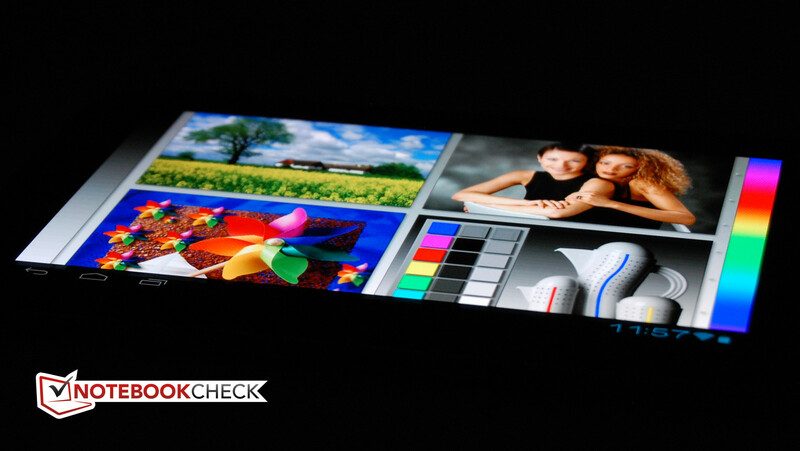 Due to its build, this screen type scores with an extremely low black value since every single pixel is illuminated. The corresponding pixel simply does not light up for black and thus: black is black. This also results in a very good contrast. However, we have difficulties measuring it. The fact is the contrast is very high. Due to the black value of zero, the contrast ratio arithmetically tends toward infinite. Toshiba's small tablet cannot convince in the brightness assessment. A maximum brightness of 146.2 cd/m2, averaged over nine readings, is very low for a laptop and absolutely unacceptable for a tablet. The brightness should be beyond 300 cd/m2 in such a portable device that virtually calls for outdoor use. 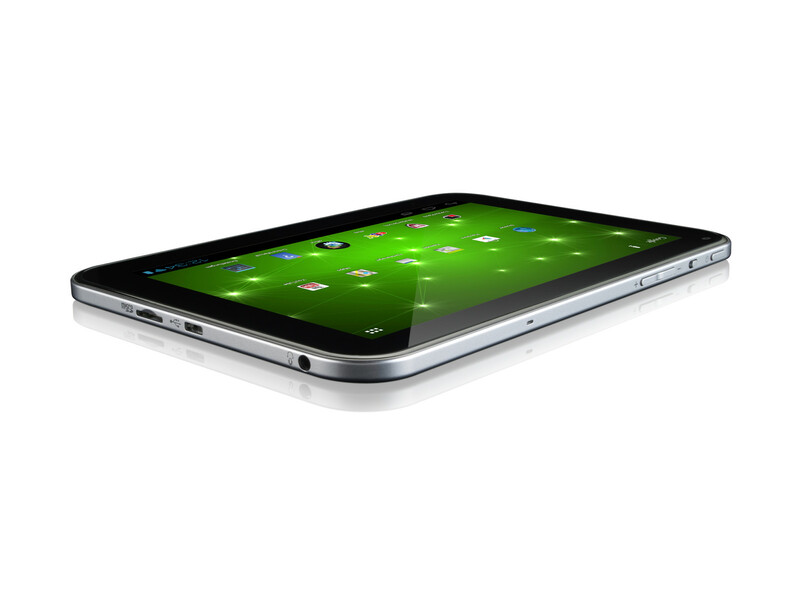 Some devices, such as Asus' Transformer Pad Infinity TF700T, even achieve a multiple factor of Toshiba's AT270 here. In return, there is no reason to reproach the illumination of 90%. The image reproduction of Toshiba's AT270 is pleasing. The AMOLED technology scores with very saturated black hues and a great contrast. The screen impresses, especially with videos and pictures. Unfortunately, we noticed a light green cast in our test device. The too high green ratio is particularly striking when compared with the screen of another neutral tablet. Nevertheless, we are basically satisfied with the picture quality. Outdoor use is one of the few sensitive points for Toshiba's tablet. We are already used to the glossy screens used in modern tablets and the surface of the 7.7-inch screen is one of the more harmless members. The low brightness is however a major drawback in outdoor use. Although the AMOLED screen's vivid colors can compensate this to an extent, the screen absorbs light like a black hole on the terrace or in direct sunlight. You can only see something when shielding the screen with a hand. Another advantage of the AMOLED technology is its absolute viewing angle independence. The colors are perceived the same from all angles. Toshiba's AT270 also confirms this impressively. 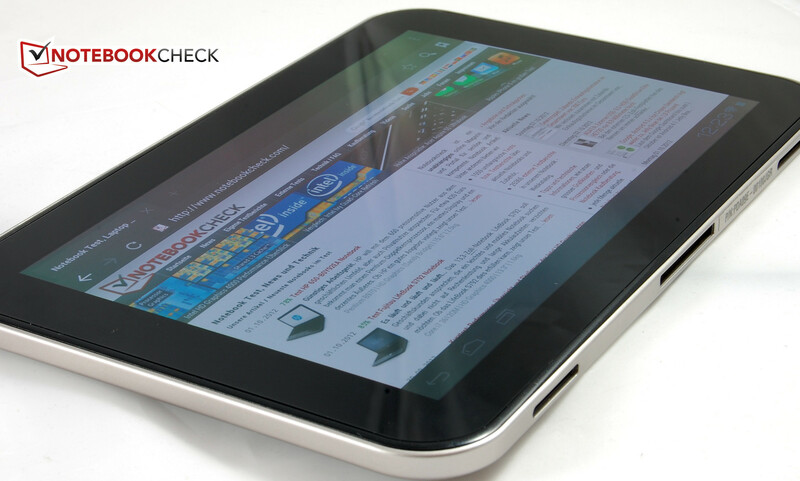 No matter how the tablet is held, the color reproduction does not change. Only the impression of brightness decrease turns up in flatter angles, which is not further annoying in view of the rather low brightness. Toshiba does not make any compromises in terms of performance and relies on Nvidia's high-performance Tegra 3 platform. This SoC includes four computing cores, an energy-savings core and a GeForce ULP GPU. The AT270's computing cores clock with 1.3 GHz in multi-core mode. The clock frequency increases to 1.4 GHz when only one core is used. Thus, Toshiba does not use the fastest Tegra 3 version like Asus does in the TF700T. However, the processor is fast enough for all imaginable requirements. The memory capacity of 1 GB is standard for Tegra 3 tablets. 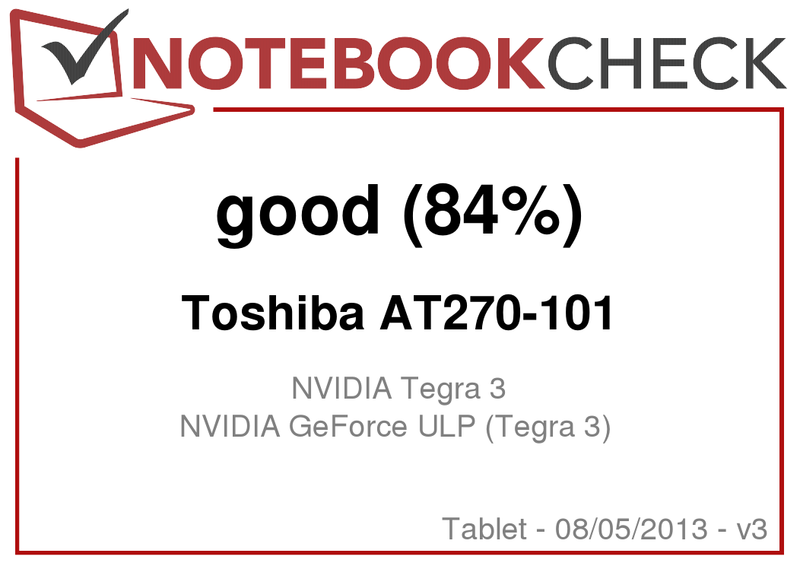 Toshiba's AT270 also usually scored on the level of other Tegra 3 contenders in the synthetic benchmarks, but only usually. 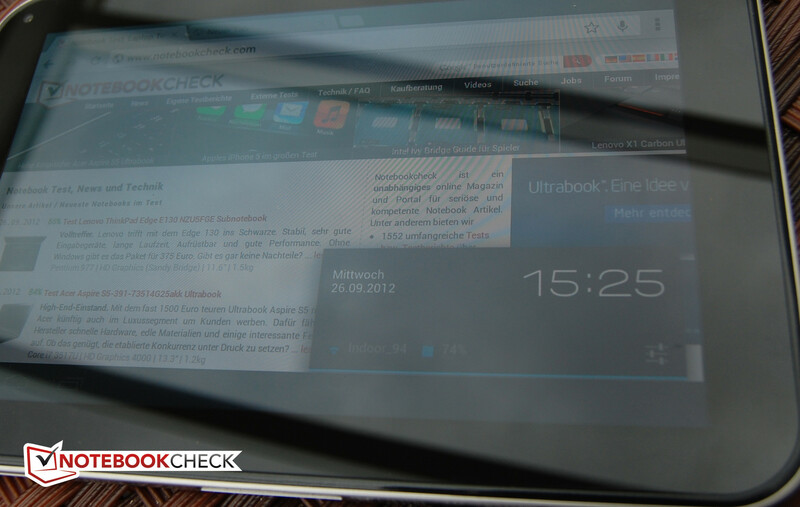 Smartbench 2012 gave the little tablet a very high score compared with other Tegra 3 tablets. 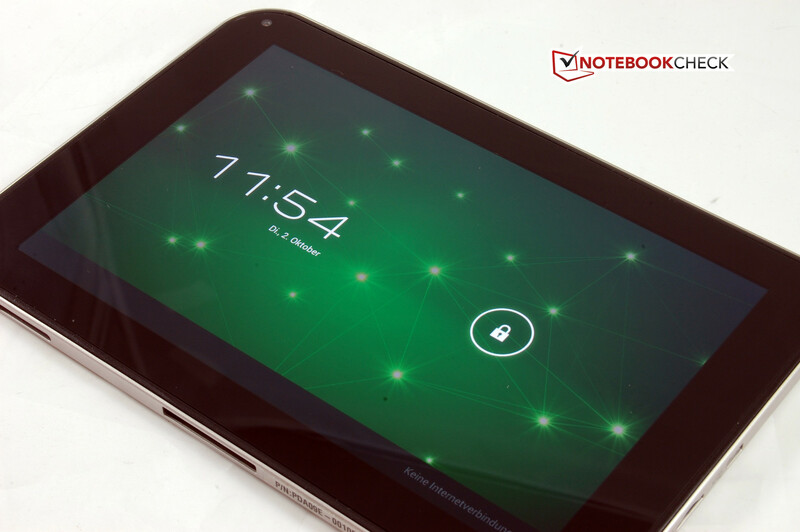 It even achieved a higher productivity score than the previous top models, Samsung Galaxy Note 10.1 and Asus Infinity TF700T. The browser-based tests showed a different picture. Here, Toshiba's AT270 has to place itself a bit behind the Tegra contenders featuring a higher clock rate. Toshiba's small tablet also keeps a certain distance to its contenders in the graphics-heavy GL Benchmark 2.5. Even without an infrared thermometer, we notice that Toshiba's AT270 stays very cool during routine use. With a maximum of 29 °C, it does not even get lukewarm and thus feels very pleasant. The case's temperatures increase a bit during longer gaming sessions. However, even during a multi-hour stability test - with GPU and CPU loaded to the max - we never measured more than 39.2 °C. A very good rate. The tablet obviously has an efficient thermal design. The PSU also only got lukewarm - exemplary. 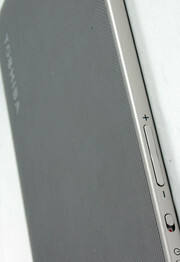 The case's limited proportions naturally restrict the possibility to install a particularly strong battery. Thus, a lithium polymer battery with 15 Wh and 2940 mAh is used. 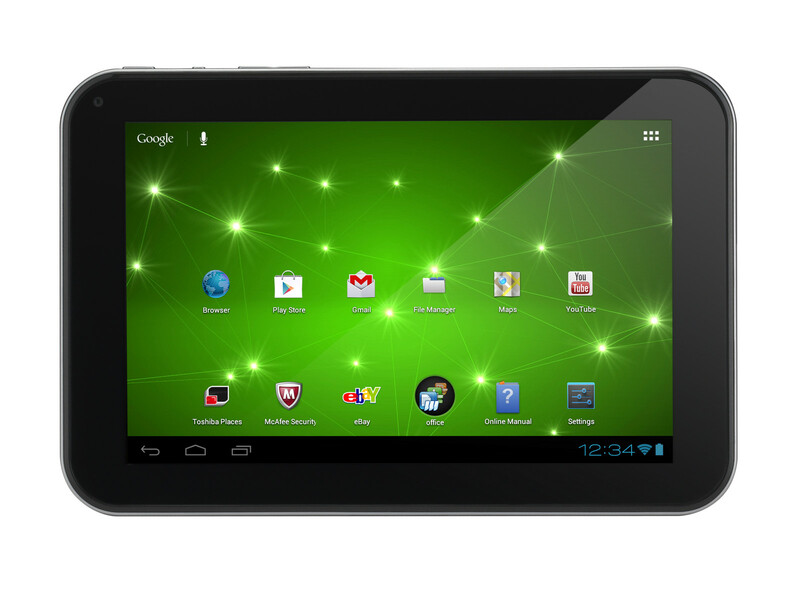 Comparably large tablets, such as Google's Nexus 7 or Samsung's Galaxy Tab 7.0 Plus N, supply at least a similar capacity. The tablet has to manage its resources efficiently in order to achieve a reasonable battery life with this power reserve. The AT270 accomplishes this in idle mode at any rate. The power consumption ranged between 0.5 and 1.6 watts. Everyday consumption will sooner be at the upper end of this range due to the low brightness. We also had to perform or Wi-Fi test in full brightness. The power consumption increased up to 4.2 watts during heavy use, which is still a moderate rate. 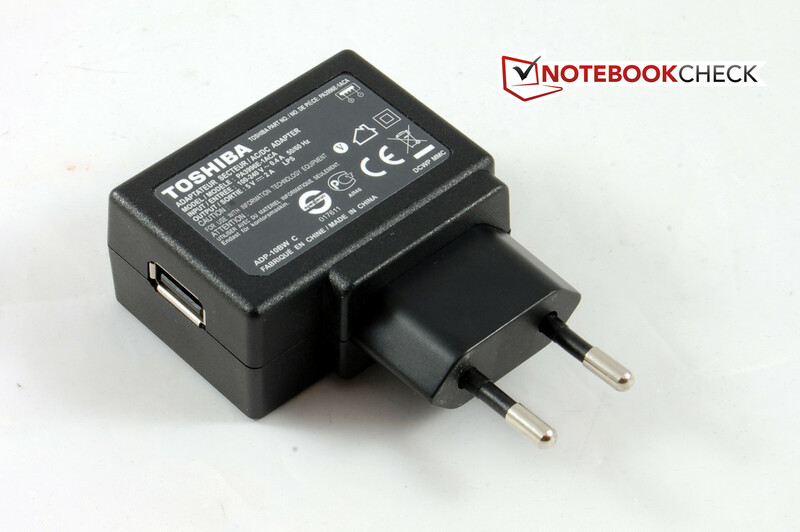 Toshiba's AT270 cannot translate its moderate power consumption rates into very long battery runtimes. The results of almost four hours during full load and 13:28 hours in minimum load are absolutely acceptable and even good in view of the device's size. In return, the tablet is not as compelling in the practical Wi-Fi test. Roughly five hours away from the outlet is a bit tight for long Web sessions. We would be even more enthused if it wasn't for the moderate screen. ...if it were only a bit brighter. The given brightness is simply too low for a device designed for mobile outdoor use. Although the AMOLED technology can compensate this a bit, working on the AT270 in the sun is not much fun. This is also true for the pictures taken with either of the cameras. But we reproach this in virtually every tablet - too bad actually. 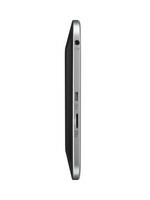 The battery life does not limit the mobility of Toshiba's tablet. The small, lightweight chassis is noticed here. In a nutshell: Toshiba's A270 gave a good presentation and we would warmly recommend it - especially if you are looking for a handy device. Mobility would however be much higher with a better battery and a 3G module. You should definitely check the screen before buying the tablet. 549 Euros (~$707) is certainly not a bargain. In return, the warranty model deserves extra praise. The box is like the tablet: slim. A slider locks the screen. rear-face cameras are positioned in the corners. The Android operating system comes from Google. but the color reproduction is saturated. The workmanship is absolutely convincing. The compact, very lightweight device is the perfect companion for long trips. Performance and equipment are also in line with that. We don't dare ask for better cameras anymore. But higher brightness is a must. Toshiba wastes the AMOLED technology's potential. We find the fact that Toshiba offers so many and fair warranty options both congenial and professional.